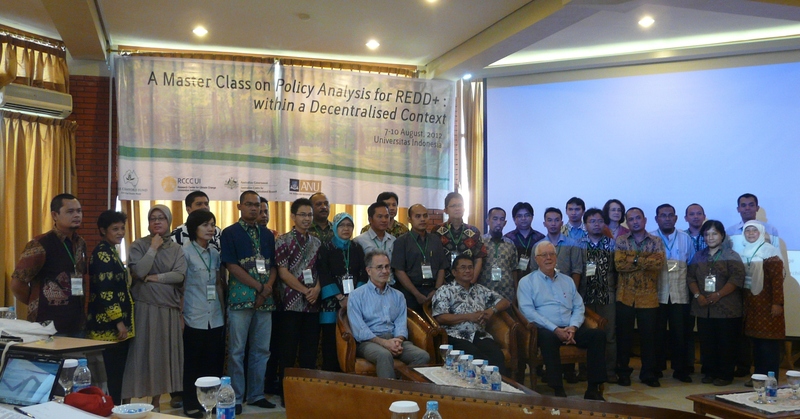 RCCC-UI is Hosting A Master Class on Policy Analysis for REDD+: Within a Decentralised Context. REDD+ requires developing countries (and local governments) to set aside additional forest conservation areas that may not necessarily yield additional environmental services for local residents. Additional forest conservation competes with other land-use activities, such as commercial logging, timber plantations and oil palm plantations, which can legally take place in productive forestlands. REDD+ involves technical complexity in terms of its design and implementation and it is also very contentious as stakeholders have different values towards land use and forest management. For this reason, local governments need to be familiar with frameworks and tools of policy analysis for REDD+ and, most importantly, have the capacity to define policy problems and solutions with relevant stakeholders. The Crawford Fund and the Australian Centre for International Agricultural Research (ACIAR) are funding a Master Class on Policy Analysis for REDD: within a Decentralised Context, at Wisma Makara, Universitas Indonesia on 7-10 August. Approximately 25 invited participants from Indonesia are taking part in the 4-day intensive course conducted by the Australian National University in collaboration with Research Center for Climate Change, Universitas Indonesia. The training workshop will provide comprehensive information about REDD+ to local governments to enable them to make informed decisions, and develop skills in conducting policy analysis for REDD+ by applying policy analysis framework and relevant tools. During the training, participants will also have a practical opportunity to apply policy analysis framework and tools to develop REDD+ policies taking into consideration regional specific characteristics.